Hiya guys, I hope you've had a great weekend. Lots of sunshine is washing away all the snow so I'm hoping it'll be really nice out for Valentines. Do you guys have any plans for that weekend? Well plans or not I think we can all enjoy some themed polishes! 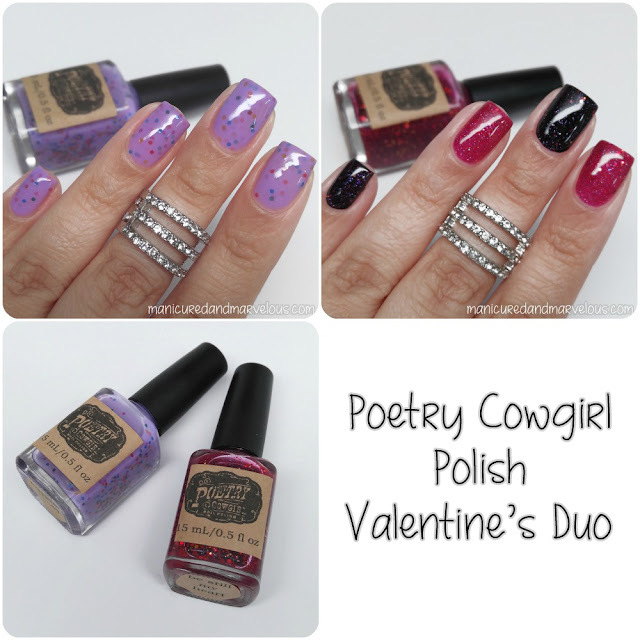 Today I am sharing the newly released Valentine's Day Duo by Poetry Cowgirl Nail Polish. This is my second or third time trying out this indie and so far I have been a fan so I definitely went into this with high expectations. Let's go ahead and jump right in guys. 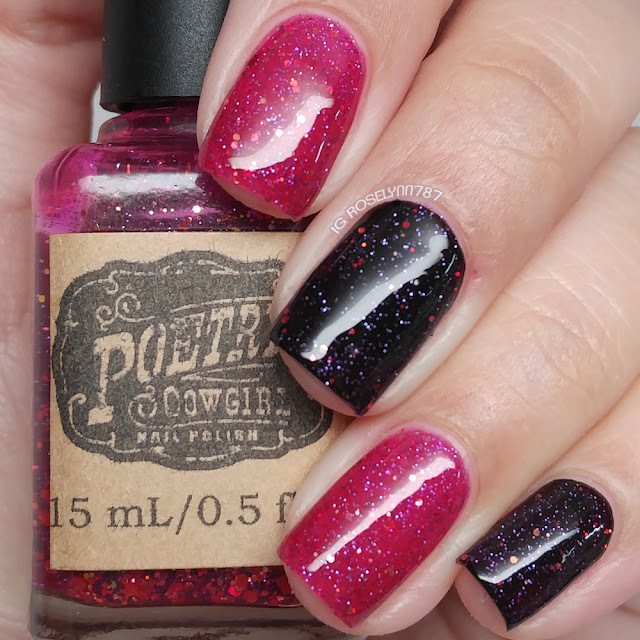 The Valentine's Day Duo by Poetry Cowgirl Nail Polish is now available for purchase. The duo is only available in full-size and retails for $18.00 plus shipping. Carnival Candy can be described as a lavender crelly with scattered holo packed with translucent rainbow hex glitters. Shown here is two coats sealed with double the glossy topcoat. I am so in love with this fun glitter combination because it's so spring/summer friendly. All the glitters really stand out and pop against the softness of the lavender. Nice formula with a lot of glitters coverage in a single stroke. Really good consistency as well, the glitters don't clump and it gives the finish a nice sparse look. It dries to a semi-gritty finish due to the amount of glitters so I ended up doubling up on the topcoat for a smooth finish. Be Still My Heart can be described as a berry red jelly packed with gold and red holo glitters, iridescent micro glitters, and lavender micro glitters. Shown here is three coats on my index and ring finger on its own. On my middle and pinky I have one coat over a black base. As always my swatch has been sealed with a glossy topcoat for a smooth finish. This gorgeous jelly was designed to be worn as I've shown in here, both over a base or on its own. I normally find polishes designed like this to favor one method over the other, but I totally can't decide with this one! Formula has a nice consistency and the polish self-levels really well as it builds up on the nail. Just look at the squish on that finish! Ah nothing more satisfying than a red jelly. Overall expectations were definitely met with this duo as both polishes are so gorgeous. Love the formulas on these, but more so the shade selections. I feel like the colors really are season friendly towards spring and even summer. 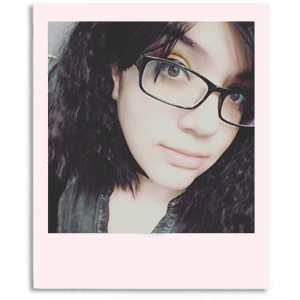 But what do you guys think? I know this is still a fairly new indie on the scene, have you had a chance to try out Poetry Cowgirl Polish yet? Oh, I really feel like that purple is super unique for a Valentine's day collection! It's so fun! Such fun shades! And how versatile is that second shade?! Be Still My Heart is really pretty! These are gorgeous! I love Poetry Cowgirl! She keeps getting better and better. Gorgeous swatches! Be Still My Heart is my fave! Carnival Candy is a fun shade. I don't think I've seen another purple quite like it. That second shade is awesome both ways! No wonder you couldn't pick a favorite way to wear it! I actually frankened a polish like Carnival Candy once, lol! I've yet to try Poetry Cowgirl. I am really digging that you layered the berry one over black! Both are so pretty! I think the second one is my favorite, but both are so well done! I love that you layered a jelly over black! Such a great idea, and it shows the polish in a whole new way!